I got all of the border finished (inside and out) and started working on the inside again. As soon as I get Emma finished I plan to get back to her. ETA: Faye has now finished Emma Mills! It looks amazing!! You've been stitching up a storm Nicole. Emma is lovely and you know how much I love Ann G.
Love the original floss colors for Christmas Garden... such a pretty sampler. Love all three projects and am always thrilled to see a post from you!! Maybe I will start Christmas Garden tonight! Have a good rest of the weekend. I am excited about watching the Oscars and stitching tomorrow night. Love your works in progress. I love Christmas garden too! I haven't purchased yet, but it's on my mental list of things I love. A girl has to have a break now and then; right? And what a beauty you're breaking on! The colors of your fibers are so pretty for CG - no wonder you decided to stick with them. Have a great rest of the weekend stitching - headed there myself. Fun projects! Emma is coming along very nice and pretty, so as Ann Grant! (Where is my Ann? On vacation?) And Christmas Garden, you will enjoy that one, too. Sounds like you are going to be very busy with among three pretty girls! Love your new start! I have been eyeing Christmas Garden too, so pretty. The new start is sweet. Ann makes me stare whenever I see a photo. I'm not crazy about a lot of color but she is just magnificent. Emma is lovely, and you've made great progress on Ann!! I can wait to see your start on the BD piece! Please consider linking up your progress at my stitching party! 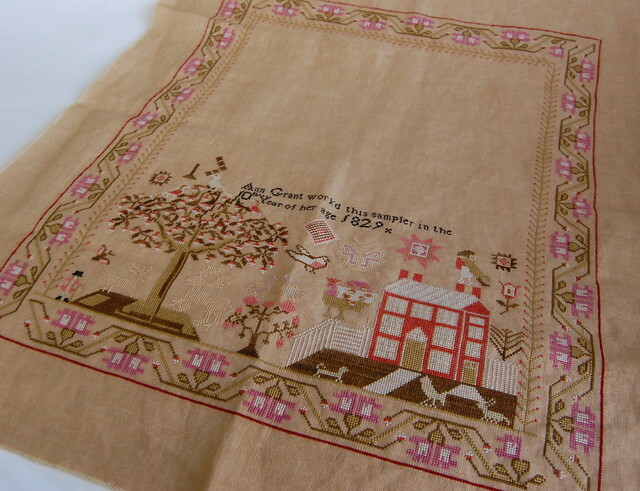 The border on Ann is gorgeous and how clever of you to stitch it first. I always dread borders....they take SO long! Emma is so pretty and Ann is beautiful! I need to kit up Christmas Garden, don't know when I will be able to get to it. Emma looks like a sweet sampler. Do you think those young girls were not taught to count and that is why the words are not evenly spaced - it always seems amazing that they could do such intricate work at tender ages. I love the border on Ann and you have completed it so fast. The threads look great for Christmas Garden. Ann is wonderful. So beautiful. Emma is coming along nicely. 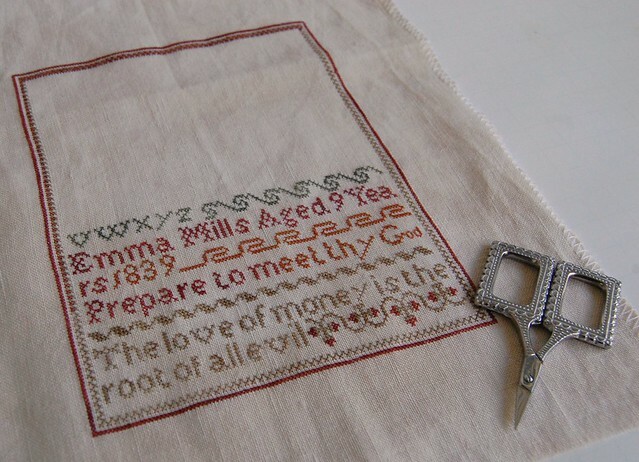 Emma Mills is a lovely sampler and Ann is just gorgeous! Christmas Garden is another beauty. Emma and Ann are both so beautiful. Love your stitching progress. Nice progress on your samplers, Nicole! Love the choices for Christmas Garden--I can't wait to see some WIP pictures! Everything is so pretty!!!! Ann is on my short list to come back out :-). I am very close to finishing Christmas Garden, probably not today but hopefully tomorrow or Tuesday!!! All 3 designs are lovely. I would probably take a break from Ann too, but you have made great progress on Emma. Looking forward to seeing your new start. Emma is looking so very pretty! And Ann is gorgeous - great job doing that whole border! Christmas Garden is on my short list. Looking forward to seeing your progress pictures! I just saw Faye's Emma, and yours is going to be just as pretty. That's a great little project. Nicole, Emma is such a sweet little sampler! Ann is beautiful and I love the inside border! I don't really noticed it before. 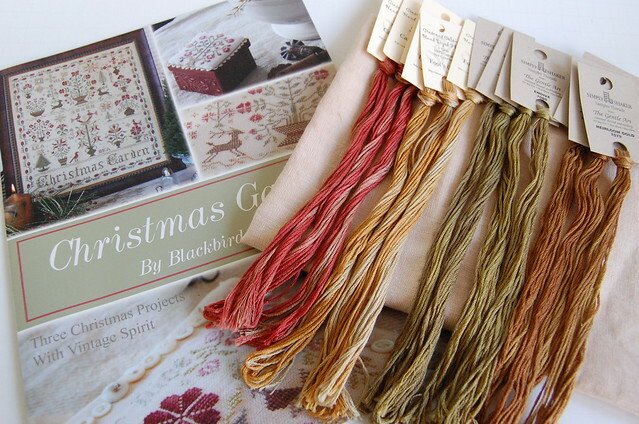 Gorgeous threads for Christmas Garden. They look perfect on the V. Light Examplar. Lovely stitching on both samplers, and I hope you enjoy Christmas Garden as much as I did. Wow, you're really going to town with Ann and with Emma. And Christmas Garden is a beautiful piece. I think you're going to have a hard time deciding what to stitch! The vintage light examplar will be perfect for this one Nicole! Thanks for linking me. I am looking forward to you starting CG and watching your progress, you will love it!